DeepCloud AI is an AI-Driven Cloud Computing Infrastructure. 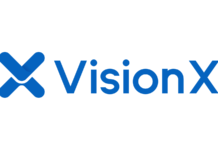 Their goal is to democratize cloud computing and level the playing field for resource providers and application developers.’ It is a global platform in which prides itself in its secure nature, customization and AI driven system. 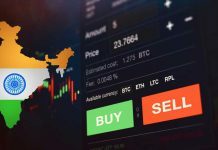 They are offering a spot market for the buying and selling of computing resources along with building an AI-Driven decentralized cloud computing platform for running IoT and Web 3.0 dApps. There is also a marketplace for pre-validated dApps for developers wanting to speed up their development process. Essentially it can be described as not just a decentralized computing project, but a one-stop-shop for creating Dapps, exchanging excess computing capacity and utilizing pre-validated dApps to build upon. Max Rye – CEO – Experience as Senior Systems Engineer at IRS, Regional IT Director at Hyatt Hotels. Many roles as Project manager and leader along with CEO management experience in tech based businesses. Computer Science Background. Geeta Chauhan – CTO – Worked as CTO/AI Practice Head for Silcion Valley Software Group, CTO of Nokia and more. Worked in senior tech roles for 20 years + in notable companies. Miroslav Sala – Cheif Marketing Offcer – Analyst and perfomance manager for eBay. Sales team and data manager. Benson Leung – Project management Director – marketing and project manager experience at Adecco and Espirit . Darryl Lo – Business development manager – Founder/CEO of Alpha Blockchain Solutions, strategic partner i Pchain – Head of community management at Zebi and Sentinel chain. Derin Karim – Head of Community Management – Community manager at Pchain and Zebi and project director for Alphablockchain Solutions. Joseph Vargas – Prinicpal AI/Cloud Architect – Experience in Cloud Computing advisory and AI research along with being Senior Cloud Architect for Hewlett Packard and senior solutions architect for VMware. Maged Eljazzar – Head of AI/ML Engineering – worked in over 40 AI/Blockchain projects as AI and Blockchain developer and architect. AI team lead at Botler.io. Yurii Oleksyshyn – Senior Blockchain Developer – experience as lead blockchain developer at The Divi Project, XSN-Core. Software Engineer at Toptal, sport contract and more. Felix Castro Rodriguez – Head of development team south america Region – Head of software development at TV Azteca and Athensa.tv.The DeepCloud AI Team – Highly experienced 10 people team – no more information about specifics of the team. Hitters Xu – CEO of Nebulas – Founding director of Ant Finacials Blockchain(NEO) Platform, Gemplay and more. Worked at Google and Microsoft. Vishwas Manral – Security Advisotr and founder/CEO of Nano Sec, Advisor for 0chain, Cloud Security Alliance Silicon Valley Board Vice Chairman and more. Ahmed Sayed – AI/Cloud computing and networking advisor – worked as senior researcher at Huawei Technologies, PHD in Computer Science. The Founders have a great mix of real life business and technology experience. CEO Max Rye seems very focused on the success of the project in a business related way along with Geeta having worked in cloud and CTO positions for over 20 years. The business, management and tech experience is quality however there is a lack of blockchain experience amongst the management. 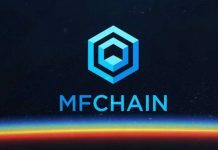 The business and marketing team have good links with blockchain particularly through community management and engagement experience in projects such as Pchain and Zebi, along with the Founder of Alpha Blockchain Solutions being the business development manager. It is good to see such a strong marketing focus in the business team with CMO and project management supporting the broader business experience of the founders however the marketing experience behind the members is not excessive. The Tech team has a lot of depth. They have a broad mix of experience ranging from AI, Cloud, engineering and blockchain experience. It is good to see so many positions outlined. The list of ’10 AI Highly experienced people’ has not being expanded on however upon chatting with the CEO Max it is due to the need to remove ‘poaching’ from the public however they seem strong. Hitters is an excellent addition to the team, having a hands-on role in the project and utilizing his business contacts and position in the crypto space which will be beneficial. The other advisors look promising and just add to the strength of the tech team. Overall the management and tech teams seem very impressive with a great mix of experience and expertise. The business team marketing focus is great, however may lack a slight bit of business development/senior roles of very experienced individuals. Although the Management team lacks blockchain experience it is made up throughout the rest of the supporting team. 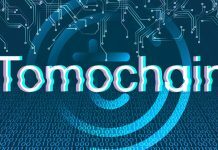 – The artificial intelligence driving the platform which integrates blockchain technology to provide a unique identity for each node. – The security from the ground up – addressing issues around blockchain ecosystems lacking security. 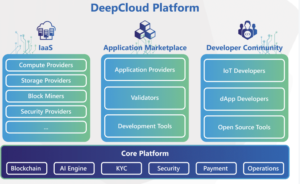 The Deep Cloud Platform consists of Network Resource providers (the people who provide resources to the network) Network users (The users relying on the services offered by Deepcloud to run their dApps) and the developer community (Open source tools and contributor community for developers). 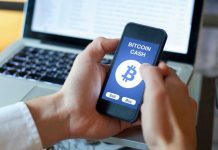 DeepCloud AI has also recently revealed they will be implementing a feature called DeepTransfer for transferring files securely on the blockchain which will be free to use for casual users and monetized for enterprises. It is predicted that an increase of infrastructure as a Service (IaaS) from 36% in 2017 to reach $34.7b by 2020 and is the highest revenue generating area in cloud computing as mentioned in the whitepaper market analysis section. Currently the Cloud Computing space is mostly monopolized by large tech giants. 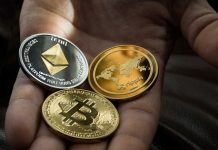 There are Many competitors in and outside of cryptocurrency, but large market share is attainable with growing demands for the platforms, particularly in the blockchain area. Deepcloud AI defines itself as a AI-Driven Cloud Infrastructure in which differentiates itself against competitors in the way of its Masternodes, Configurable nodes, SaaS and IaaS, leveraging Artificial Intelligence (AI) for resource management, the marketplace and more. AWS from Amazon and Google Cloud are competition in the real world and now offer very cheap solutions to cloud computing along with security and privacy and server guarantees so the DeepCloud AI project has to prove they can compete. In a growth comparison of Golem; 0.0101 USD Up 1800%+ since ICO. SONM ICO price 0.77 of ICO and currently at 0.39x the price. There is a relatively strong demand for Computing projects as shown by the large market caps attained by competitior projects. However considering the most successful cloud computing ICO Golem is only at around $180m and reached $1b at its peak the potential in the market in short term is questionable for similar projects performing in the bear market. DeepCloud AI will face several business challenges in the decentralized computing space particularly in regard to adoption in the market along with Security and Privacy requirements of data. The adoption and challenge for market share against real world competition such as Google and Amazon being very influential will cause conflict as they will not allow a competitor to take market share with ease. The impact of many competitors in the cloud computing space including recognizable names such as Golem or newer ICOs such as ANKR will put pressure on the business and make execution and marketing all the more important. Although the project is a ‘tech project’ the business will need to be just as strong for it to succeed! The whitepaper is thorough and well written. It provides information ranging from a business and market analysis perspective, to the technology used, token structure and sale. To read the whitepaper in full click here. DeepCloud AI has a strong view on partnerships and are firm believers of partnerships adding value to both partners and not just joining up to look good for the investors in the ICO. The partnership scope will range from both dApps and normal Apps who will be able to use the platform which is great for adoption and allowing traditional applications to utilize blockchain cloud without starting their systems from the beginning. DeepCloud AI are also very firm beleivers in revenue and monetization as it is a business, so there is pilot partnerships projects that will run on the Deepcloud AI platform to test these strategies. 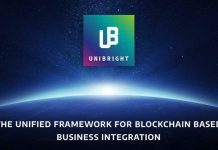 There are multiple confirmed partnerships and more to come from both Blockchain based companies and non blockchain. 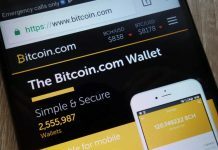 Most partnerships will be targeting the Latin America, Asia and Europe regions, and there will be plenty more partnerships released as time goes on. The idea itself is not unique for the decentralised computing project however it does have its own differences and competitive advantages particularly through the use of AI and developer community. It is good to see them offering more than just a cloud computing model along with the new DeepTransfer which is said to be similar to WeTransfer but on the blockchain. 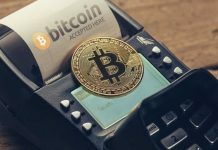 The competition is large in the market, on both the cryptocurrency and the non-cryptocurrency side of things. This is good in the sense it shows demand for such projects and growth in the industry however it makes it hard for projects to standout and even if they are different to for example the recent ANKR, a lot of investors in the market don’t know that. It would be good to see benchmark prices that DeepCloud AI will offer that beats the AWS and Azure solutions. DeepCloud AI will have to market themselves greatly as they are attempting to do currently to stand out. The small crowd sale will be beneficial as the private investors making up for 80% of the sale will help. The whitepaper is nice to read and addresses everything that is needed in our view, if there was anything missing the team have been more than willing to fill the blanks in. The partnerships with real world Enterprises along with dApps that will use the DeepCloud AI platform is great to see. As mentioned Max is very strong on the fact that they only want partnerships that benefit both parties, not ones to just excite investors. The Nebulas partnership is promising and the help from Hitters will be very beneficial in adoption. Overall the business seems strong in the sense of actually aiming to generate revenue through the service tiered packages for enterprise customers however there is large competition and the success will come down to how well the project can make themselves stand out before. 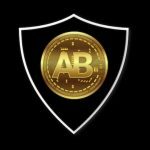 During and post their ICO on September 10. DeepCloud AI are utilising AI in combination with blockchain technology to work in hand to provide a self-organziing distributed network. 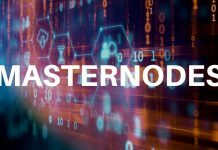 The network consists of three main nodes – the Master Nodes – command center, Network contributor nodes – Contribute resources as work nodes and Side-chains – used for scheduling and handling issues in the network. The consensus mechanism used is Proof of Service (PoSe) utilizing DeepClouds AI matchmaking Engine Controller this allows for resources to be allocated based on real-time analysis. The main aspects of the AI controller and match-maker for the resources within the network is sharding and side-chains. The utilization of sharding and side chains is to gain as much knowledge as they can. The functions of these include the tasks of Getting node state, Collation analysis, network analysis and side-chain analysis. There is an MVP for the DeepCloud AI platform and a video preview can be found here. There is currently trialing on the platform and as expected by the roadmap larger scale users are soon to come in q4 2018. The MVP has three aspects: the resource provider view – shows the nodes across the map, application developer view – Shows the application status and resource usage details and administrator view – Dashboard used by operations team to manage all resources, top resource providers, applications developers, applications like fortune cookie are running etc. Monitoring crucial parameters and AI matchmaker. Although only a quick demo it seems to be functioning and we look forward to seeing the feedback from the tested dApps. 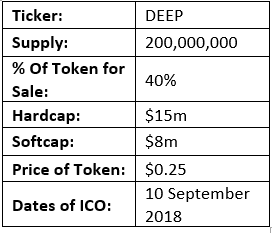 The Deep Tokens are not valued through the development progress, but the demand of the market. – As a payment method to Network Resource Providers and Application Marketplace Providers. The DeepCloud AI core service will be cost free to users with only higher end enterprise customers paying a fee based on a tiered service model in which the DEEP tokens will be used for staking to use the platform services. The project is utilizing grid computing and allocating/collecting revenues from enterprise customers who may want to run dApps however the benchmark difference between current methods of AWS and Azure is lacking. Also the fact that the grid computing exposes data with for example AI or IOT edge dApps not being ‘sliced and diced’ without some other kind of cloud or grid which may again expose the data. It will be very complicated to eliminate data privacy exposure. There has been research which shows SGX intel may be prone to spectre-type attacks and used as malware delivery vehicle although the CEO says most of these issues have been resolved. Other technological challenges lay in regards to the performance of decentralized cloud infrastructures including syncing between nodes, matchmaking algorithms, scheduling criteria and fair incentives for any network contributors. DeepCloud AI seem to me solving all these issues with the technology and methods mentioned above include AI matchmaking, Proof of Service consensus, membership protocol and more however mostly only theoretically at this point. The AI engine to match the resource allocation seems impressive and will differentiate DeepCloud AI from the competitors in the Cloud Computing space. The use of sharding and side-chains is good to see also. 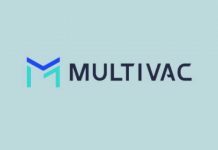 It is great to see an MVP product ready for utilization by testing enterprises and dApp developers. From the YouTube video demo, it all seems to be functioning and there is expected to be large scale usage late this year! 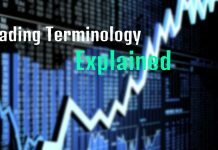 The token utility is promising in the sense there are multiple avenues of using the token, along with multiple avenues of acquiring the token. 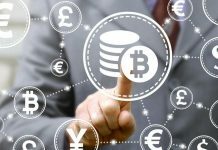 The token also will used to monetize the project and bring in revenues from enterprise customers which is great to see. The issue in regards to privacy data and security of the network will play a large factor in adoption as the trust of users and enterprises with sensitive data, particularly in Deep Transfer will be a large consideration. Overall the technology mix implemented seems like a good fit, however not completley original or ‘All-Star’. The MVP is released however there has been too little feedback and usage of it to understand its success. It will be good to see the team solve the challenges in security along with the rest of the issues mentioned and solved theoretically in the whitepaper. The Twitter has 1250+ followers and the account is relatively active in posting however lacks engagement with the community. There is currently no Bitcoin Talk or Reddit links for Deepcloud AI. The website has a smooth User interace with all information easily accessible including team, roadmap, partnerships, technology and more. The Medium posts are few, though informative and relevant information. They contain details regarding Deepcloud KYC, technology and partnerships. There is currently no Discord or Slack. The Telegram has 12,000+ Members with Active, responsive admins and an engaged community. There was no Airdrop and the membership growth seems organic. There have been interviews with notable YouTube channels consisting of more than 80,000 subscribers in which a positive attitude is held towards the project. 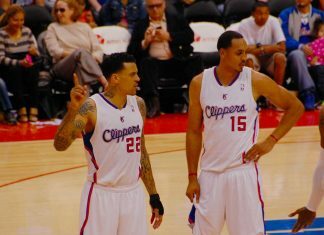 They have recently appeared in multiple interviews such as the Token Tank Appearance. AMA’s have been popular and both Max and Geeta seem to be happy discussing all aspects of the project. With the lack of notable VC funds backing the project along with smaller ICO reviews in the past – the hype is quite low for the project. However with the recent spur in interviews, AMA’s and other social appearance the hype is slowly building. 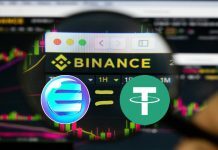 The sentiment surrounding the project is positive and the hype will see an increase with the release of enterprise partnerships. Search trends are low, with no Google data to show. Ranked 1.3m + website with the most popular search terms being deeplcloudai and deepcloud ai. The website is easy to use and smooth which allows for a good user experience and access to important information about the project. Looking at the social media channels, Telegram is the most popular and utilized channel and the communication and engagement within is impressive. The Twitter and Medium are active however as mentioned lack interaction from the community although that is fair enough as they are more for notifications of partnerships, KYC and more. It is good to see organic growth in the Telegram as the DeepCloud AI team have recently been very active in interviews, AMA’s. With a Token Tank appearance last week along with interviews in the past with CryptoLark, CryptoZombie and more. There is a positive sentiment flowing in these reviews which is very promising for the project. Although quite large exposure in the 3rd party review and press releases the hype has remained relatively low, maybe due to the slow progress and long time-line of reviews dating back as far as 3-4 months ago. The VC investors are lacking any large or notable funds which often bring in a larger hype and demand – this is also the case in the more specific funds who have not seemed to go ‘crazy’ about DeepCloud AI yet. Overall, the team is doing a great job marketing and getting the project into the community however there just isn’t that hype amongst VC’s and the general community. 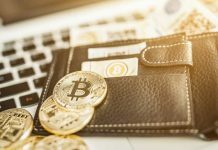 It will need to see a larger increase in demand and hype leading up to the ICO in September if it wants to have a real go at thriving in this bear market. The Token distribution is 40% for sale, 15% allocated to bootstrap initiatives, 15% for the development team, 20% held in reserves, 5% toward marketing and adoption and 5% for advisors with a 2 years vesting period. Up to 25% bonus in private sale with base tokens released upon centralized exchange listing and the bonus portion 3 months after that. There is also a pre-sale 10% bonus with the same vesting periods. 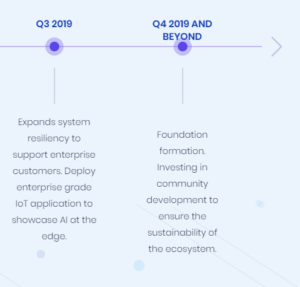 The Roadmap shows the milestones since the inception of DeepCloud idea in July 2017. 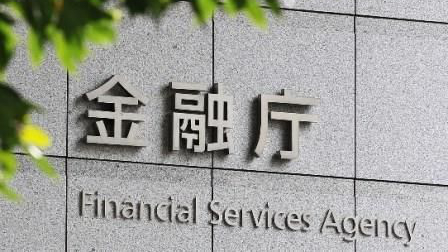 With a test-net already implemented, the testing of large Scale dApps is not far away and expected to be used on the platform by Q1 2019. The marketplace launch is expected in Q2 2019 and the fully function platform by Q4 2019. The Token metrics are transparent and all information has been delivered to the community prior to the crowd sale which is very good to see. The 40% sale is promising, decentralizing the nature of the currency however the Crowd sale itself is only 20% with the rest being private sale, so not very ideal for the community wanting to get in. 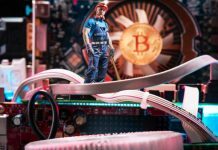 The Hardcap seems fair for such a project and in the current market conditions still attainable for top projects. 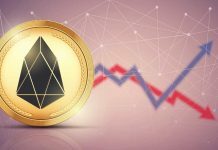 The private bonuses and lock up periods are prmising and offer early investors a good benefit whilst allowing crowd-sale investors protection over ICO dumping. The roadmap is promising, they have seemed to have reached their Milestones up to this point of time and the future isage of the platform by real large scale enterprises is not far away at all which is a very good things to see. We love seeing projects with real MVP/products at the ICO stage not just an idea. The link with Nebulas could play a very large role in adoption along with the enterprise partnerships that are said to be lined up. Also the revenue model with a tiered service for enterprise customers will help in the development and longevity of DeepCloud AI as a business. However the reviews seem to accurately score DeepCloud AI hence there has been no additional X-Factor Bonus Points. Overall the team seems solid and their is a strong confidence in the management of the long term success for DeepCloud AI. Having spoken to the CEO Max ourselves he seems very proactive and has a strong viewpoint on making the project generate revenue and be a real world business. 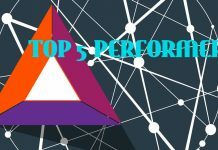 The partnerships although are promising have yet to be any large enterprises or dApps that excite the community along with the competition being so great in the decentralized computing market. Having an MVP out is very good to see, too many ICO’s are seeking crowd-sale funds with no real product to show for and for dApps and entreprises to begin using. 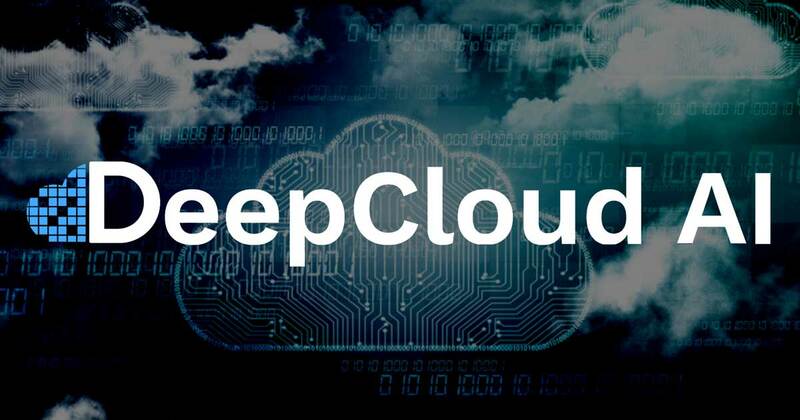 DeepCloud AI has its many differences and use of AI along with the Developer community and more however it still feels like with such a competitive market and the lack of hype surrounding the project heading into the crowd-sale it may be slow. 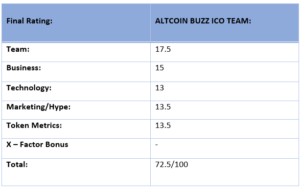 The token metrics seem like a great fit and the team is very transparent about it all however the 20% allocation to the public is not ideal and almost goes against wanting to community to be involved in the project. 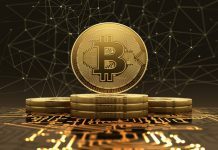 The smaller allocation to the public could be beneficial in the bear market with private investors making up for the majority. Keep and eye on this project, even if it doesn’t take off after the ICO it seems like it has a strong team, foundation and will be around for a long time!